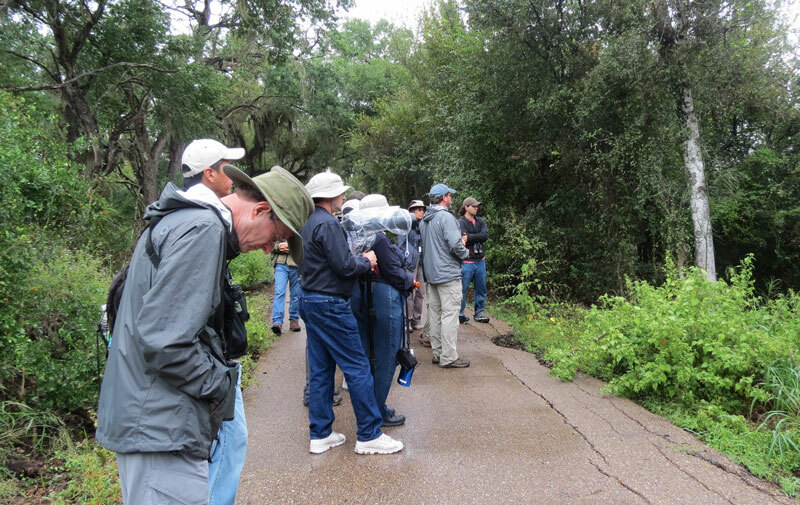 The rain had slowed to a light drizzle as our Birding by Ear group headed out to the parking lot at the Santa Ana NWR on my first day at the Lower Rio Grande Valley Bird Festival. 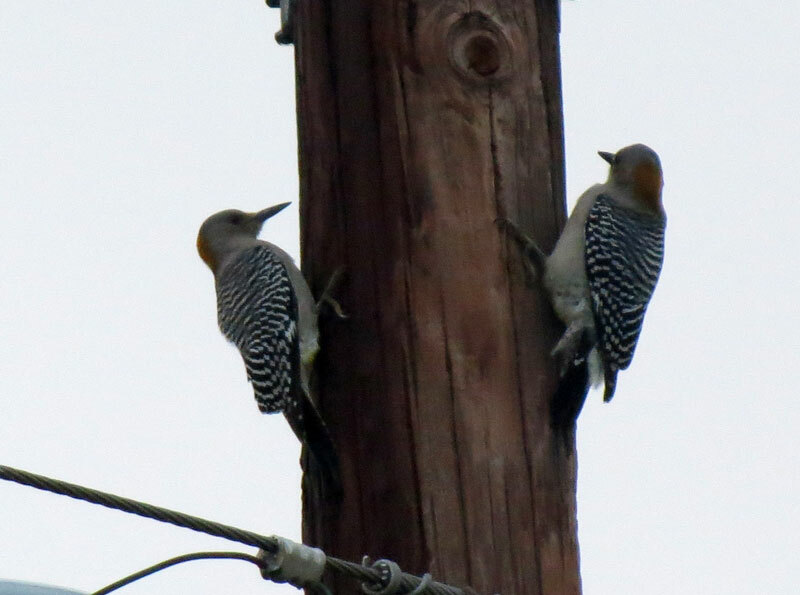 A couple of Great Kiskadees were calling back and forth to each other. While many of the birds in the valley were unfamiliar to me, the kiskadee says its name. 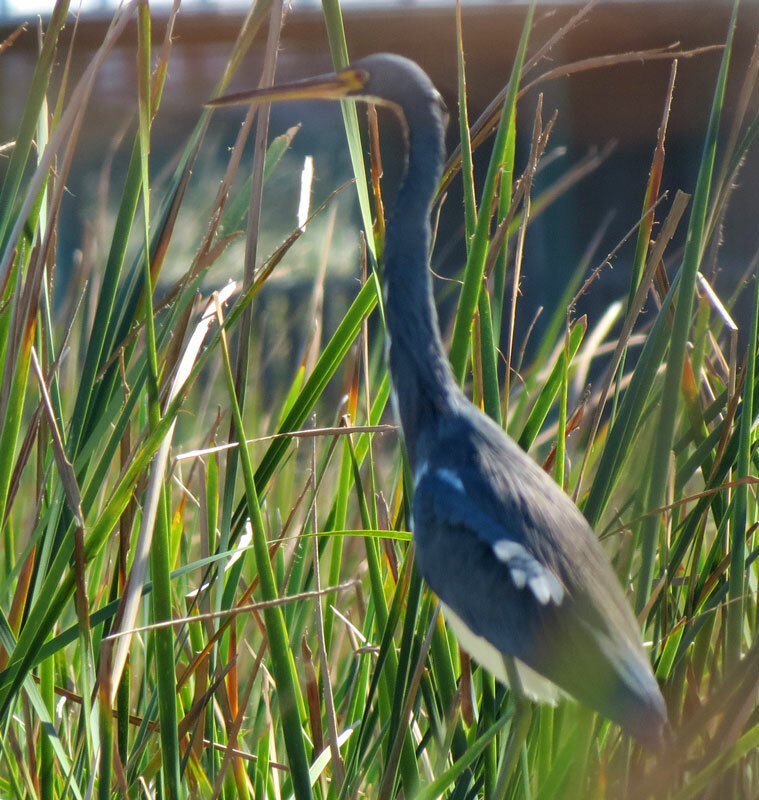 Our guide, Michael O’Brien, shared a story about his step-son who asked his parents why the bird he heard kept saying, “kiss my rear,” to illustrate that one of the keys to learning bird songs and calls is to say the sound out loud and develop your own mnemonic. He called it an active listening process. The dismal weather actually turned out to be an asset for this type of trip which needed to focus on listening. If the weather were better, many of the birds would be more visible instead of hovering in the underbrush. As we passed a row of dense understory, Michael had us compare the call of a Black-and-White Warbler with that of an Orange-crowned Warbler so we could discern that the call of the Orange-crowned was more clipped than a Black-and-White, “like clicking two dice together,” he described. The harsh buzzy call notes of a number of House Wrens emanated from the bushes. At the edge of the parking lot, we listened to several birds foraging in the adjacent field – Killdeer, Red-winged Blackbirds, American Pipit. 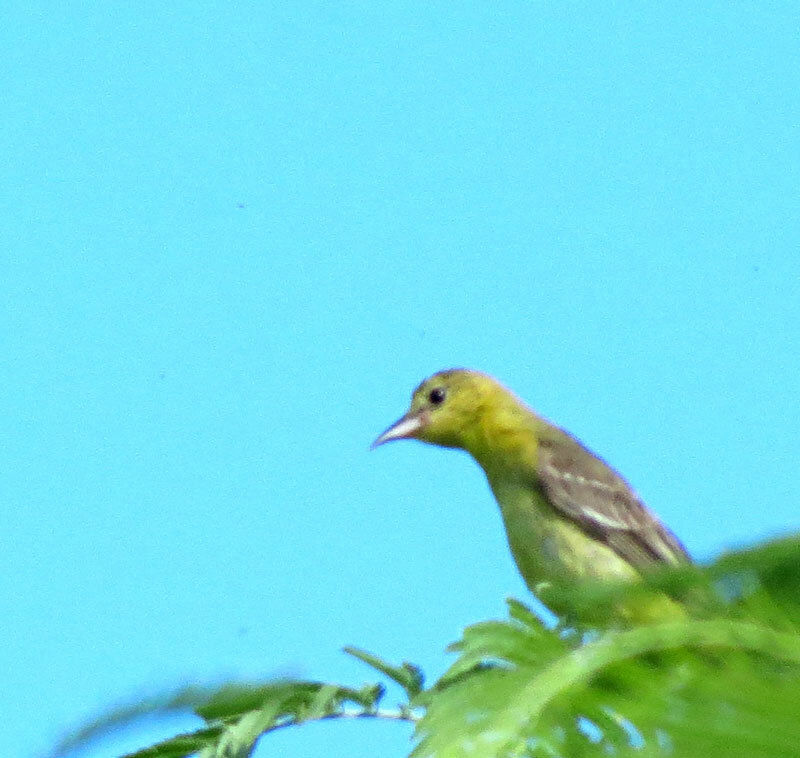 A bird flew over – “Hooded Oriole,” Michael stated. “You can distinguish it by its undulating flight. Barn Swallows swooped over the field, along with a few Northern Rough-winged. We started along the paved path through the refuge. As we crossed the acequia we heard a distinctly thrasher call – deep and throaty – Long-billed Thrasher. And then the rain picked up, pelting us as we walked quickly back to the Visitor Center. Michael continued our lessons from under the Visitor Center’s covered entryway. As he played various call notes from the playlist he put together from xeno-cantu, he asked us to describe the pattern, quality and pitch of each call. When the rain let up, we headed back to the trail. 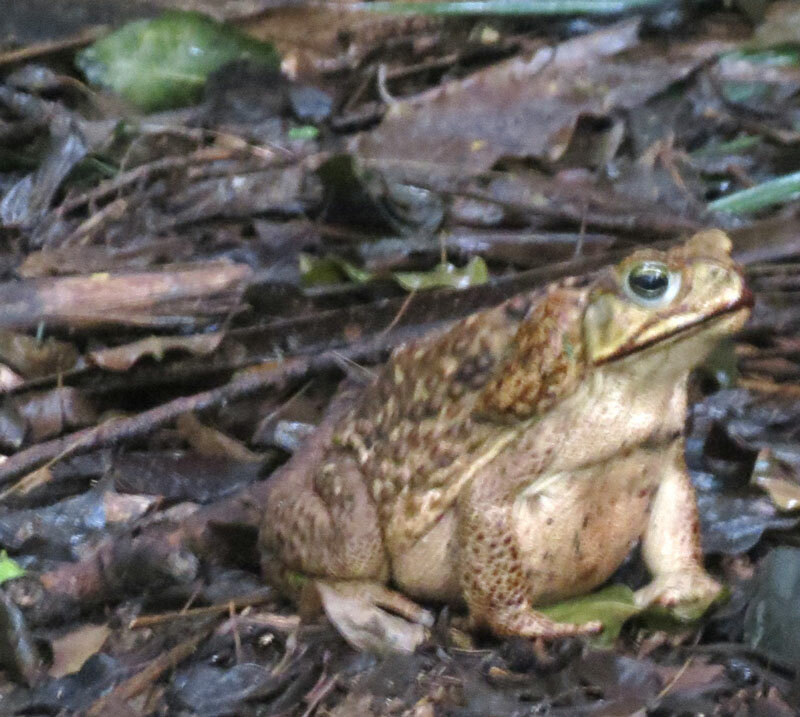 A Marine Toad, as large as a bull frog, scampered into the underbrush as we headed towards it. We ended the morning with 45 species – mostly heard. At 4:00 I boarded one of three vans for what those in our van would term as the ‘parrot chase.” Our guide explained that each of the vans would drive up and down streets in areas where Green Parakeets often feed before flying to their roosting area. The rain was still coming down in sheets as we drove through the parking lots of shopping areas not too far from the convention center. Finally, one of the vans found the parakeets in a palm tree across from Chili’s restaurant. When we arrived at the spot and unloaded the van, the rain was coming sideways, making it difficult to try to see the parakeets in the stop of the palm tree. Suddenly, about 25 more parakeets arrived, circling above the parking lot, which allowed us an opportunity to see their long tails, yellow-green breasts and yellow throats as they flew over us. Next we set out in search of Red-crowned Parrots on the other side of town. Our van found them first as they swirled and chattered over a neighborhood. We followed them, driving up and down streets in the neighborhood until they finally landed. We pulled up on a side street where we could watch them as they fed in a large tree in someone’s front yard – and then they were off and we scrambled back in the van to follow them, while Michael, our guide, gave a running commentary on their location with his cell phone on speaker so the others could find us. The next morning my friend Barbara and I boarded the bus headed for King Ranch – Norias Division at 6 am. Our guides for the trip were Tom Langschied from King Ranch and Raymond VanBuskirk. As we traveled to the ranch in the rain, Tom gave us an overview of the ranch properties and wildlife habitat. 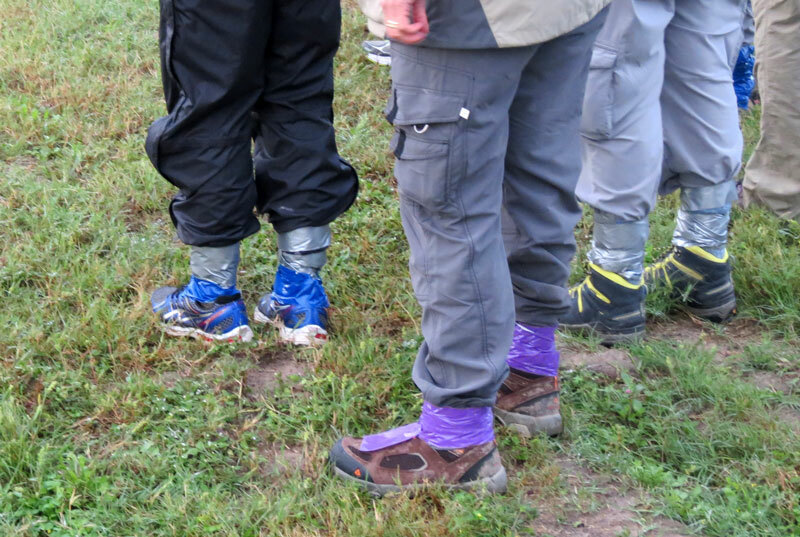 “There are ticks and chiggers in the grasses, so I have brought along some duct tape for you to wrap around your pant legs,” he told us. That was our first job after exiting the bus. and Vermillion Flycatcher entertained us – flashes of red contrasting with the gray sky as they dove for an insect. It was barely drizzling – a good omen. “While the Ferruginous Pygmy-Owl often does not call on cool mornings, Barbara a King Ranch tour guide who lives on the property, contacted me to let me know she had heard one calling this morning,” Tom told us. Before we started our search, Raymond shared information with us about the differences between a Northern and a Ferruginous Pygmy Owl. While they both have bold spots on the back of their heads that appear to be eyes, the coloring of the Ferruginous is rufous compared to grayish brown of the Northern. We walked about 50 yards from the edge of the woods and stopped while Tom started playing the call. Before long, we heard one answer. We moved a little closer and Tom played the call again. 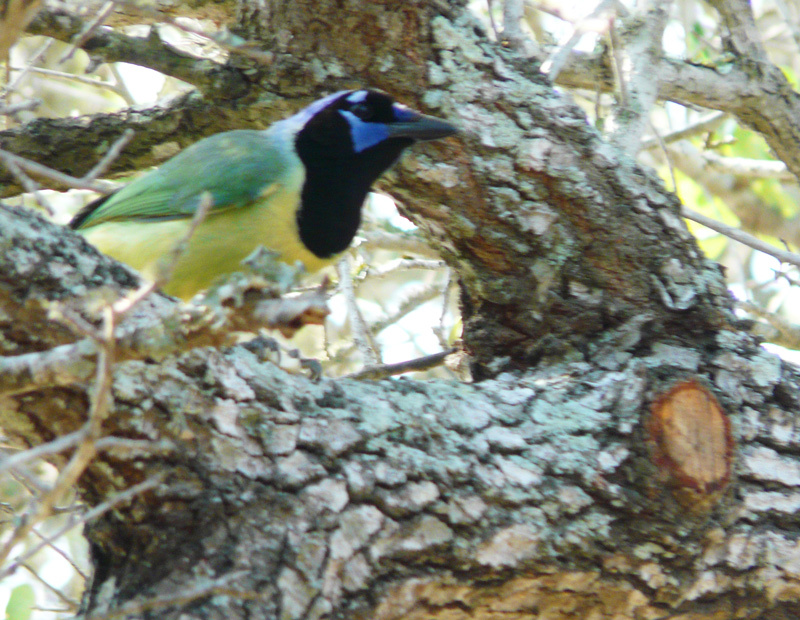 Several Green Jays flew into the woods as if to try to mob it. 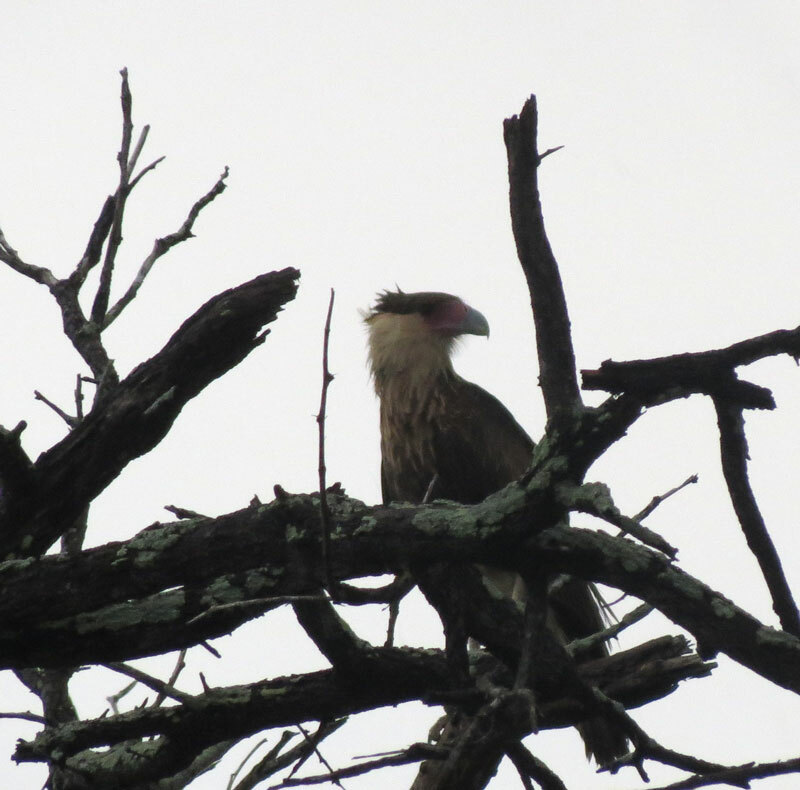 followed by a Crested Caracara. “I see it,” Raymond signaled and set up his scope. He then helped others focus their scopes on it. While I could see it through my binoculars, it was wonderful to see it closer through one of the scopes – half hidden behind the wispy leaves. We could hear another pygmy-owl calling a short distance away. Our next stop was at a lake where we scoped the waterfowl – primarily American Wigeon, Northern Pintail, and Ruddy Ducks. There were a few Gadwalls, Redheads and Lesser Scaup. Raymond provided a tutorial on the differences between Greater and Lesser Scaup – pointing out the ocular patch on the female Greater, a new field mark for me. “Now let’s walk along the service road,” Tom suggested. “just in case we might find an Audubon’s Oriole. Several Northern Cardinals chinked from the trees, but never showed themselves. A Long-billed Thrasher called. Raymond pointed out a calling Blue-gray Gnatcatcher and we heard both House Wrens and a Bewick’s Wren. “Do you have bobcats here?” one of the participants asked Tom. “There are two just beyond the rise in the road.” The bobcats stared at us as we watched them through our binoculars and then turned and trotted away. I could hear the clicking dice sound of Olive Sparrows at the base of the shrubs. Raymond located a pair for us to observe as they scampered ahead of us. While the others got distracted watching a Greater Roadrunner, a yard bird for me, I continued watching the sparrows and was rewarded when one hopped up on a stick and stayed long enough for me to get a photo. Our next stop was at grasslands where we hoped to see Sprague’s Pipit. I was surprised to see one skylarking as I did in North Dakota during the breeding period. “They ascend in a stair-climbing fashion,” Raymond explained, “and then they suddenly drop into the grass.” We located it camouflaged in the short grass and watched it as it walked out to the edge of the road where it looked around, its dark eye standing out against its pale face, and then it took off again. Eastern Meadowlarks were singing at scattered locations in the grass. 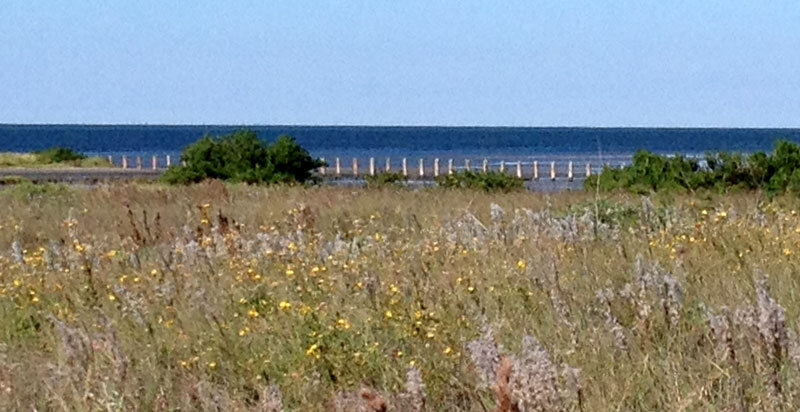 At this location we also saw two Scissor-tailed Flycatchers, Say’s Phoebe and Loggerhead Shrike. 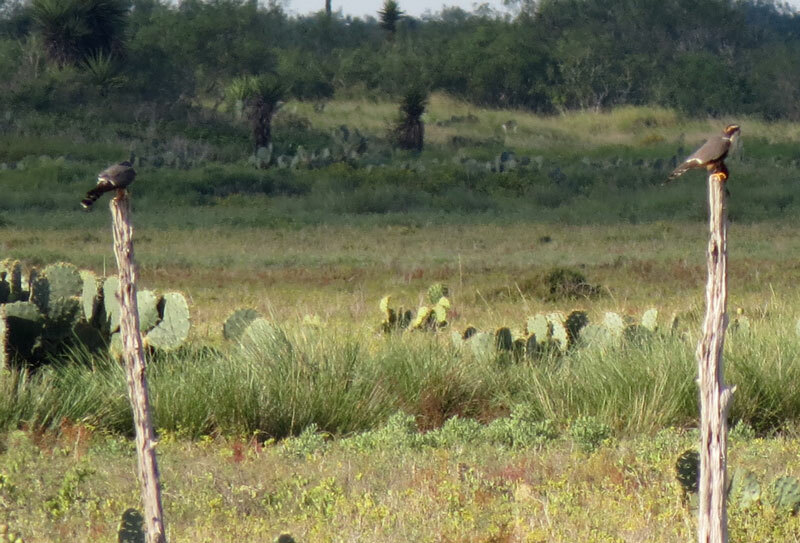 As we traveled to the final location, Barbara from King Ranch called out “We just passed a White-tailed Hawk sitting on a snag next to the road.” The bus driver carefully backed up giving us great views of the hawk, with long black wings that extended past its white tail with black band. In the oak woodlands we called for the Audubon’s Oriole again. 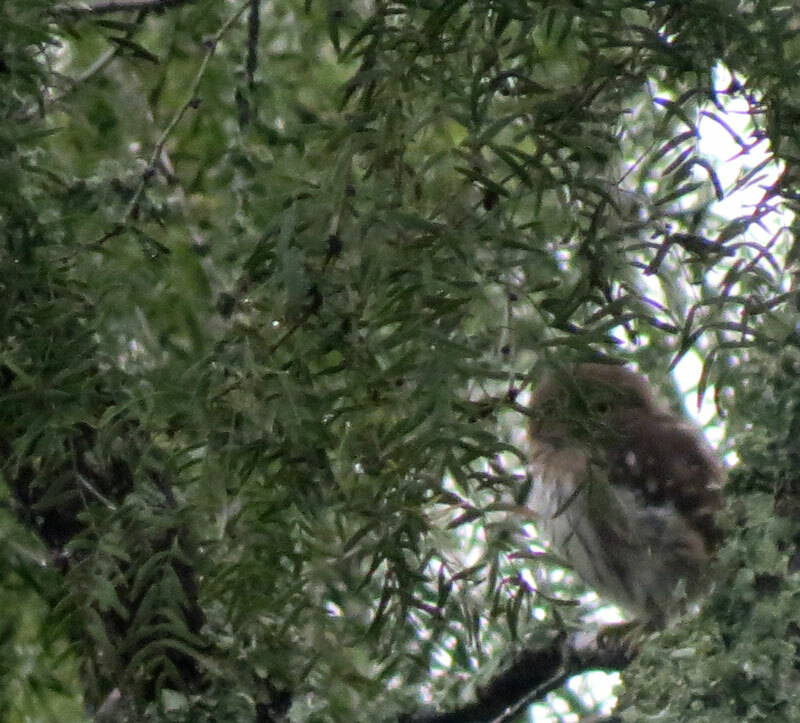 While it didn’t show up, we did hear another Ferruginous Pygmy-Owl. While we were searching for it, we heard – and some saw – a Black-crested Titmouse. 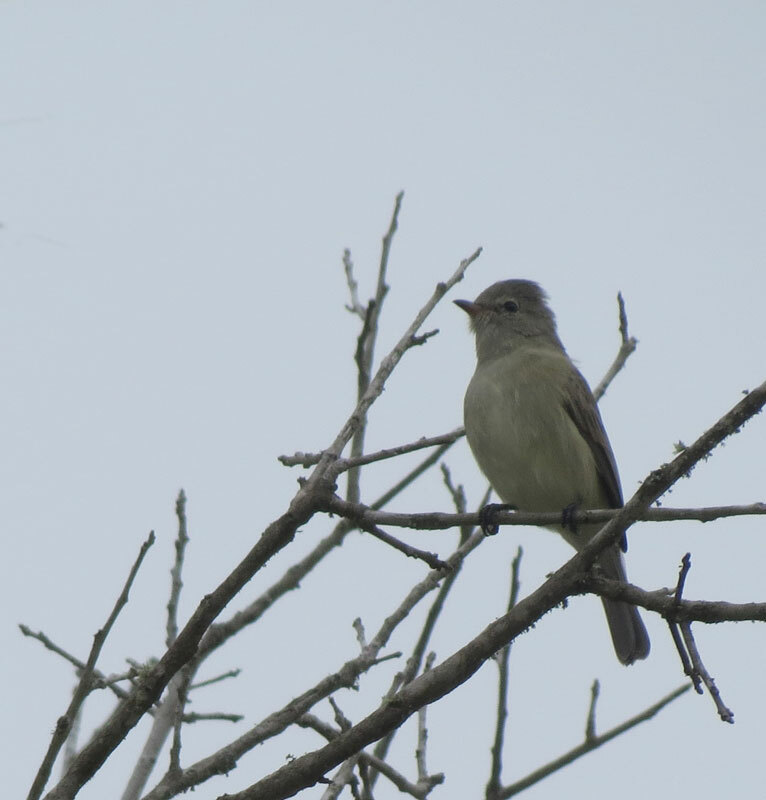 And, then we were treated to Northern Beardless Tyrannulet – a life bird for me. While it may not have a beard, it appeared to have a wispy goatee. As we drove out of the ranch, we encountered a flock of 15 Wild Turkeys that seemed compelled to race down the road ahead of us – 15 mph – until they gradually flushed into the grass and scurried away. Our species list for the day was 62. On my last day at the festival I went on a trip to the South Padre Island area. Our first stop was on Old Isabel Road. 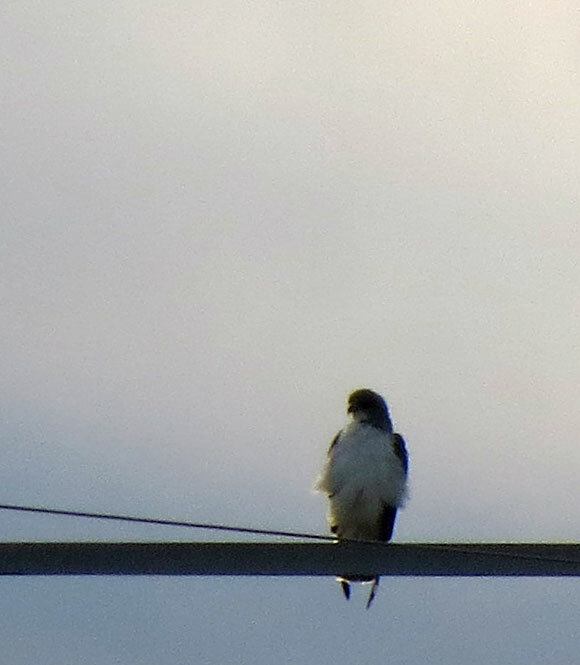 White-tailed Hawks were perched on the top of three different power poles. Savannah Sparrows and Eastern Meadowlarks called from the scrub. “Let’s drive further along Hwy 100,” Michael our guide suggested. 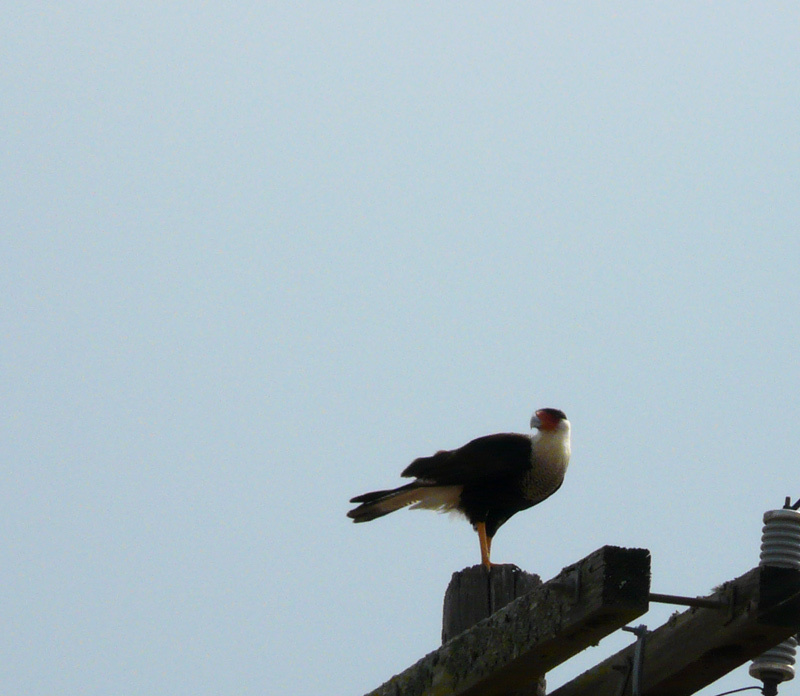 We checked the raptors on top of power poles – Harris’s Hawks, another White-tailed Hawk and Crested Caracara. 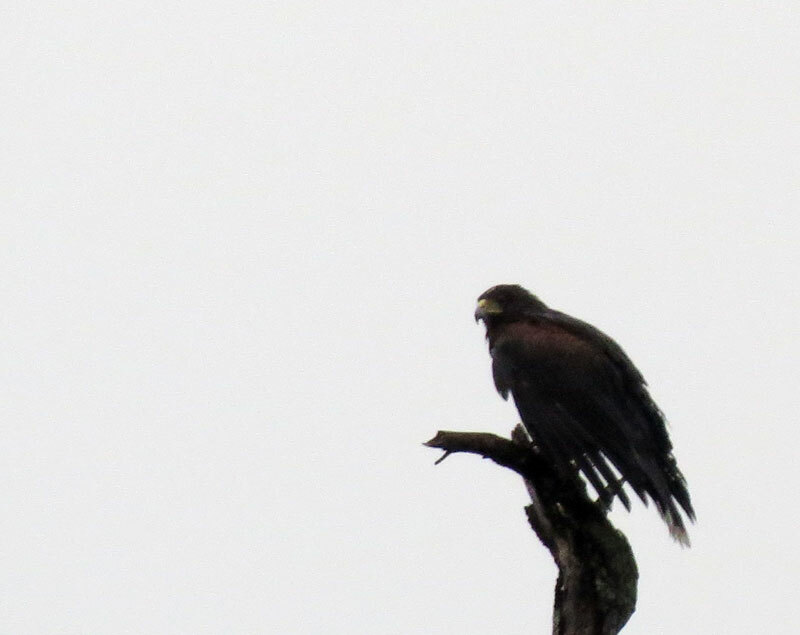 And then we spotted an Aplomado Falcon and pulled off to the side of the road. The falcon flew off from the top of the power pole, followed by a second one and swooped low over the field in front of us chasing a caracara. They finally gave up their pursuit and landed on the tops of abandoned fence posts on our side of the road, giving us great views. Further along the highway we passed one of the hacking platforms. 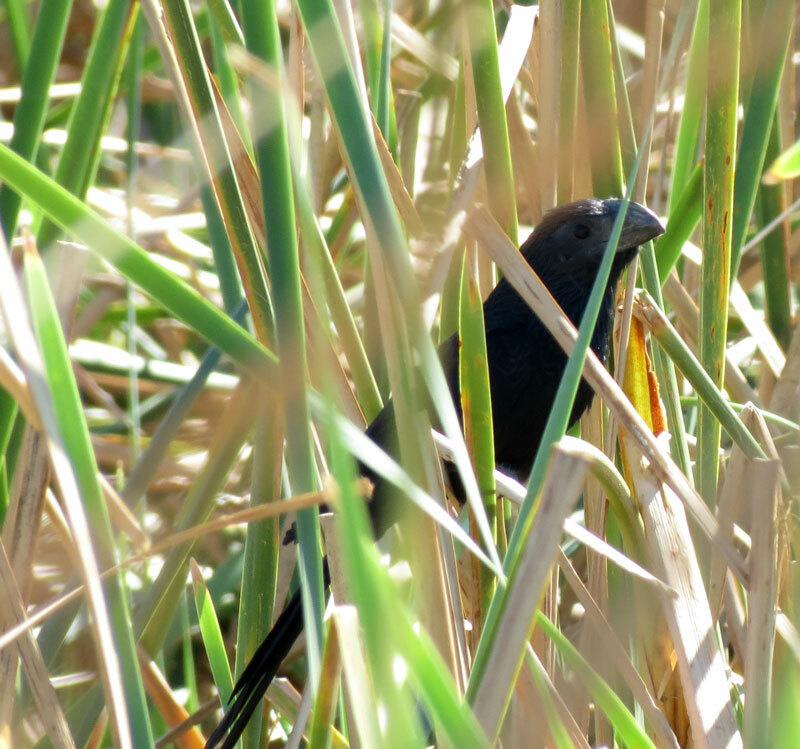 Our final stop was at the South Padre Island Convention Center where a Groove-billed Ani had been seen the prior day. 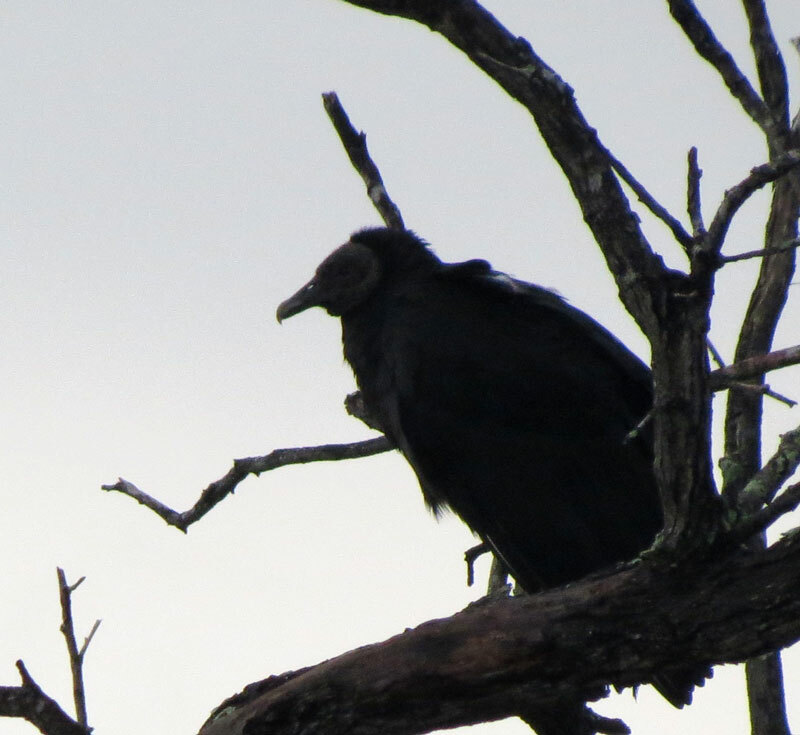 Another birder reported that it had been seen about 20 minutes prior to our arrival in the dense grove outside of the restrooms, which were abuzz with grackles, red-winged blackbirds, bronze cowbirds and starlings. As we were peering into the tangle of trees, our driver walked up and announced that he had a ‘maggie’ nearby. Since I had only seen a Magnolia Warbler in Mexico, I went in search of it and was rewarded by great looks. As the others arrived, someone spotted a Black-throated Green Warbler – a life bird for me and I had the opportunity to observe it for quite a while. And then the ani appeared on the south side of the dense grove. 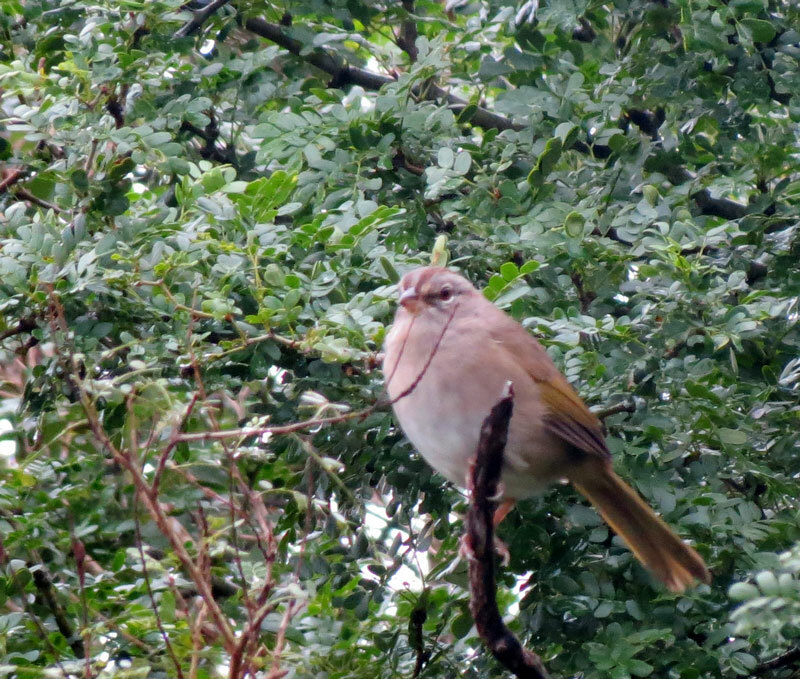 It popped up at the top of a mimosa tree for a few minutes as all of the birders gathered, and then disappeared again. A female Hooded Oriole emerged on top of the mimosa. Since we had about 45 minutes until we had to leave, few of us decided to walk out on the boardwalk. We had gone a short distance when we flushed something – an ani! The others appeared following the ani that had flown from the original location. There were two of them, clearly a pair. “While they are uncommon breeders in the valley,” one of the local guides told us, “they are rare at this time of year.” While they stayed hidden in the reeds most of the time, they emerged from time to time, giving me an opportunity to take a photo. A pair of Osprey was patrolling the area. From the patio outside of the convention center, we studied the collection of shorebirds and watched the terns (Caspian, Forster’s, Royal and Sandwich) and gulls (Laughing and Franklin’s) swoop and dive. 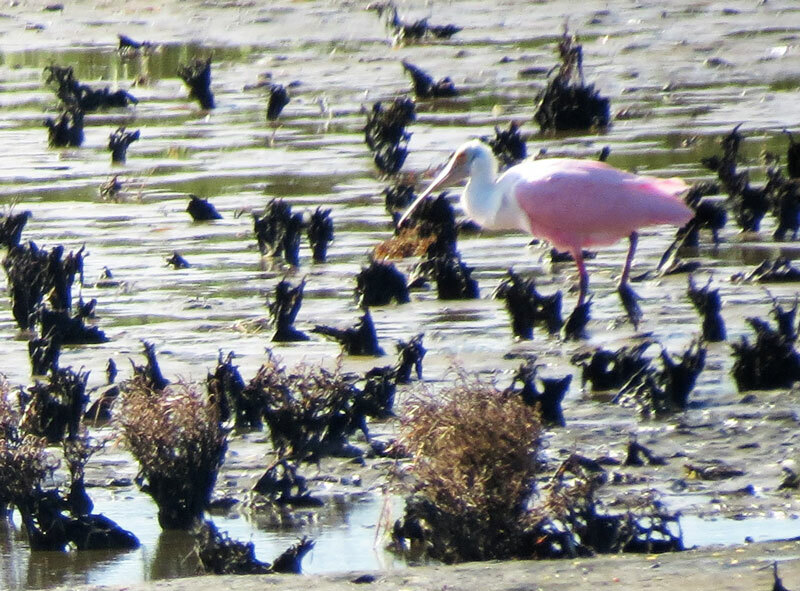 a wonderful ending to my adventures at the Lower Rio Grande Valley Birding Festival! Great post, Judy. Just the sort of detailed report I’ve craved about the festival. Sounds like you learned so much and had some fabulous birds as well.